Entertaining this weekend? 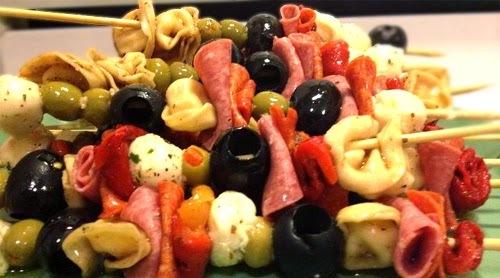 Antipasto kabobs could very well be the ticket. They're very light appetizers, low in calorie, low in fat. Healthy and tasty at the same time. Cook at least 12 tortellini per the instructions. You'll only need 1 tortellini per kabob. Cook more than 12 if you want to use additional tortellini on the kabobs. Or cook more and make tortellini soup. Once cooked, marinate them in a bowl of balsamic vinaigrette for 15 minutes or so. While the tortellinis are marinating, chop the red peppers into bite sizes. After finishing the kabobs, drizzle them with oil from the red peppers. Serve.